One of the two groups shows off its skills. 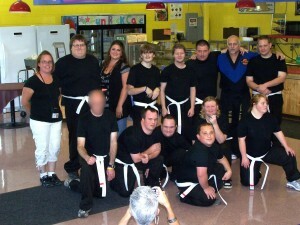 From left to right: Tim Long, Dustin Worden, Gary Moore, Susie Morrow, Andrew Bauder, Joy Preeman, and Sensei Munger. FULTON, NY â€“ Two groups of participants from Oswego Industries, Inc.â€™s LIFE program have been studying karate for several months with Sensei Jim Munger at LaValleeâ€™s Black Belt USA Champions at Great Northern Mall in Clay. At the end of July, those students â€“ and the two staff who have been studying along with them â€“ were able to show off their skills to a packed room at the nonprofit. 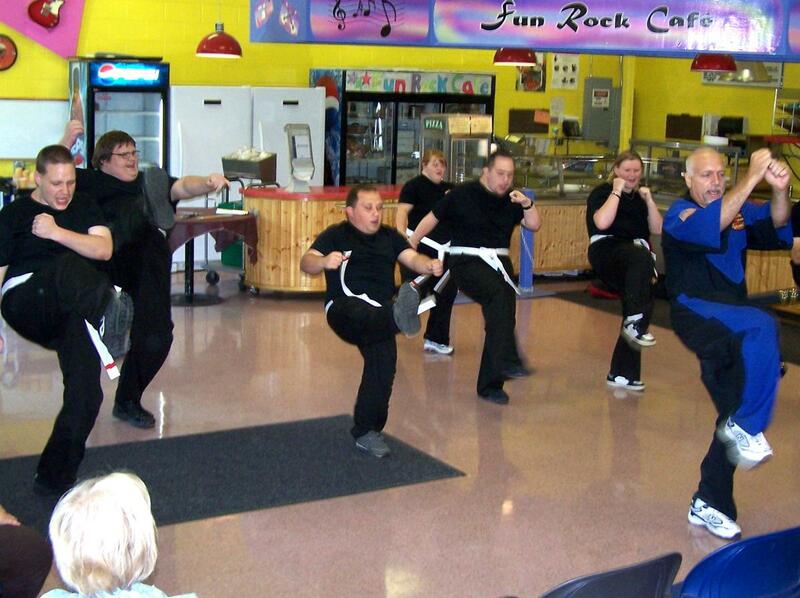 Led by Sensei Munger, each group performed blocks, kicks, and punches to an appreciative crowd. As a special treat, LaValleeâ€™s also brought five of their own students, all of whom have been studying for many years, to the event where they demonstrated forms, martial arts techniques, and skill with weapons such as nunchaku (nunchucks). Sensei Jim Munger poses with the Oswego Industries, Inc. karate students. Back row from left to right: Danielle Pullen, Dustin Worden, Katy Kingsley, Nate Wilcox, Perry Stoughtenger, Ron Worden, Sensei Munger, and Tim Long. Front row, left to right: (name withheld by request), Scott Arnold, Andrew Bauder, Gary Moore, Joy Preeman, and Susie Morrow. 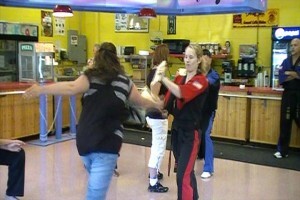 Staff members who have been studying with the groups even had a chance to break boards, to the delight of the crowd. Finally, Sensei Munger awarded patches to all of Oswego Industriesâ€™ karate students, and led the group through their commitment pledge, affirming that they will practice martial arts with humility, discipline, and respect for others. 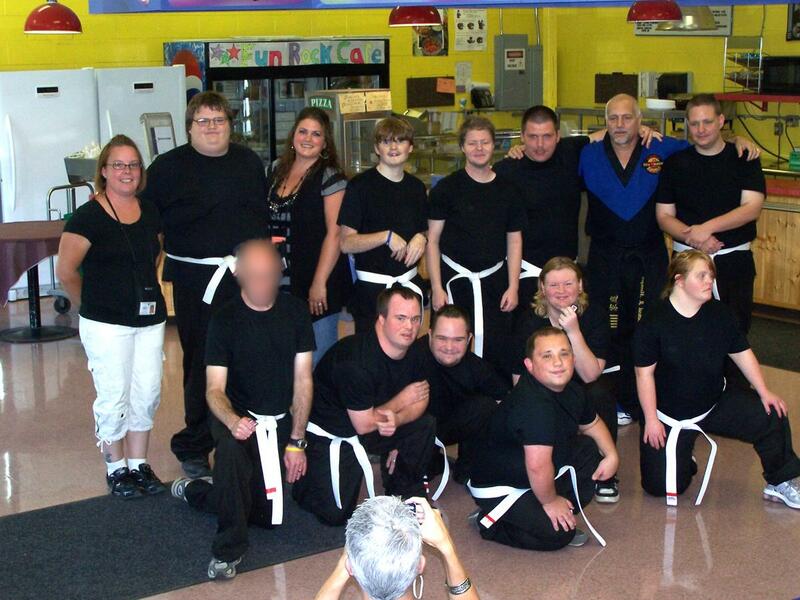 The karate classes have helped Oswego Industriesâ€™ LIFE program participants, all of whom have disabilities, to improve their gross and fine motor skills, impulse control, physical well-being, attention, confidence, and self-esteem. Selected photos and video of the event can be viewed on Oswego Industries, Inc.â€™s Facebook page. The LIFE program is a day habilitation program â€˜without walls,â€™ using the community as a classroom. Participants go on group outings to community events and locations, exploring interests in a peer group, practicing living skills, and promoting community inclusion. Oswego Industries Inc. staff member Katy Kingsley breaks boards with her fist. Oswego Industries, Inc. is a private, not-for-profit Community Rehabilitation Program which has been providing programs and services to adults with disabilities since 1968. Services include pre-vocational and vocational training, day habilitation services, and Medicaid Service Coordination. Its mission is to be a partner in the development of comprehensive community services designed to improve the quality of life for all people, with the primary emphasis on those with disabilities, by providing the necessary support programs to enable individuals to grow with dignity and achieve their highest level of independence and self-fulfillment. The organization was named winner of the Chamber of Commerce Not-For-Profit of the Year Award for 2009. Its sister agency, ARC of Oswego County, provides services to children and seniors with disabilities: together creating a comprehensive support system for Oswego County residents with disabilities.